Time to vote in the March 2012 Hot Rod Art Contest. This month's topic was "1962 through 1972 Muscle Cars". All entries are listed below, in alphabetical order by artist username. Winning artist receives a $50 gift certificate to Speedway Motors, and choice of topic for April's contest. The winner of the current contest will pick a subject for next months contest. You can submit your artwork during the month until the date the voting starts. The dates and subject for next month will be announced at the conclusion of the voting. I had a 65' GTO and could kick myself for ever getting rid of it. I went to all of the trouble to get the engine cleaned up and put it back together. It had been in an accident before I got it $300 in 71. The frame was messed up and out of alignment. So what do I do, trade it for a 67' Catallina which blew the trans after awhile. Word of advice, don't get rid for your favorite, you will regret it. I vote JB(1). Which ever is the blown GTO. Edit first reply on 65' Gto. It is Kartoon 2 that I vote for. I know it is not a 65. Nice work 57! Congrats on the win! Good going, Bob! What's your pleasure for next month? Good morning Bob, well congrats my friend! As always great work. Many thanks guys .....really appreciate it. It was great to see so many cool entries in March. I hope we can continue the great work this month. So someone please tell me more about this art contest? I am sorry i live such a busy life i do not get to get on here near as much i want. 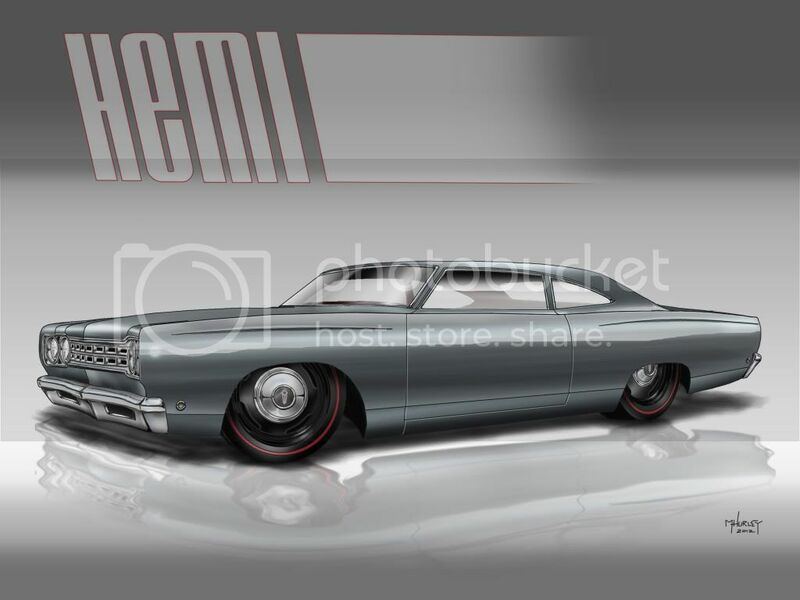 Is the first few cars (the 65 Impala the Halloween GTO and blue nova) really art work? Or is that some sort of digital thingy? If it is art, real art, done by human hands (air brush i figure) someone is flat out awesome, I good, but you are awesome. Dinosaur, good question.. 57corvette can answer what he does best, he has explained it to me before. Some use photo's and photoshop them, others do original work with pencils, markers etc on paper. I Do my art on the computer but it all starts with a blank screen starting with a "pencil" sketch using a tablet. Are you an artist? you going to join the contest? I would like to enter. (if i am not so busy i fail to get back online) So you are the guy who did the red car doing a burn out with the custom grill and hideaway headlights? That's good work also. Impressive most impressive. Better than me. i do all mine with pencil both graphite and colored i work with some sharpie pens but very little. I'll answer you here instead of the PM you sent me ......this contest is open to all forms of artwork. It can be a simple penicle sketch, a painting, a photo or any medium you want. The subject for the April contest is the 1950's ....hot rods, rock stars, movie icons etc. Check out the thread to see the date your entry will have to be in by. I look forward to your participation with us. Yes I did the car doing a burn out. Thanks! I am a big fan of pencil sketches, sometimes these are the most creative. The good thing about this contest is you can submit as many drawings as you want.... or have time to do!